While this card if face-up on the field, inflict 400 points of damage to your opponent's Life Points each time you activate 1 Normal Spell Card. 1600 ATK isn't bad. We play Breaker, who's essentially 1600. We play a lot of things lower than 1600 as well. D. D. Assailant and higher take him out, sure, but they take out a lot of things. So in exchange for using this 1600 attacker, you get to deal 400 damage every time you activate a spell. At most, you're probably getting 800 damage out of this guy before he gets destroyed. Remember, in today's metagame, monsters typically don't last on the field very long. They'll get (A) Smashed, (B) Saku'd, or (C) Widespread'd. That's up to 9 ways to kill a monster. This card can be good in the pure Spellcaster deck, don't get me wrong...but this isn't last format. In last format you had 5-6-7 spell card turns...Pot-Graceful-flip MoF back to get one of those two-use it again-Book of Moon something else/Nobleman what you booked and so on. Decks ran 20 spells back then. They only tend to run 12-14 now. Not as much of a chance for big damage especially with all the good draw spells banned. Coin Flip This card actually has potential. One card in the Spellcaster Structure deck prevents you from ever decking out and does burn damage equal to the number of spellcasters on the field. While one of these guys isn't nearly a threat, getting two or three out and activating, eh, ionno, a Normal Spell card? It'll do some damage. The whole theme of the deck is burn damage with spellcasters. Shame it'll only be purchased for common Breakers. Since, y'know, Breaker the Magical Warrior comes in it. This guy is not Breaker, but could he be good? Most def. But he won't win an SJC, and it would take a damn good player to win even an 80 person regional with him. Hell, even top 8ing in a regional with this deck would be an accomplishment. Better burn exists in the form of Magical Explosion and Ceasefire and Magic Cylinder and Stealth Bird and Wave-Motion Cannon and… Well, better burn exists, okay? But he can be good. The deck exists. A player needs to find it. Dark Paladin As my week of Elemental Energy comes to a close, we come to Rapid-Fire Magician! What week of mine would be complete if I couldn't throw a Magician or Spellcaster in it, right? If he had say 1900 attack or defense, or it were any Magic, or even either player activating a Magic card, then this card would be more playable...but it isn't. Well there really isn’t too much you can say about this card. It’s quite straight forward, decent ATK/DEF stats 1600/1200, too high for searching but too weak to really last a long time in battle. That initial drawback is what really hurts this card. The effect is a lower end burn effect as it requires this monster on the field and a normal spell. It’s nice in how it turns spells that accomplish one goal into an additional burn card, but it detracts from the actual burn decks since it works only with Normal Spells, meanwhile Burn decks utilise more Continuous and some Quickplay, this lack of synergy hurts it from being effective. In the end not worth running in burn decks and although it’s a Spellcaster it isn’t needed in a Spellcaster deck. Okay, so what’s my excuse this time? I said I was catching up, right? Well, it turns out that mice (and their nests) aren’t very conducive to phone lines. So I haven’t had internet access lately. So these are late, but here they are. Stats: Wednesday’s CotD is (was?) Rapid-Fire Magician. He is a “classic” Level 4 Dark/Spellcaster, and has a 1600 ATK and 1200 DEF. This makes him, at this point alone, and okay attacker. Just barely big enough that he can fake being a beatstick when needed (e.g. when you just need to pound an opponent for decent damage). Unfortunately, he’d be a lot better off if he were smaller: 1450 ATK, for example, would make him so very searchable while slipping under Messenger of Peace and/or being a Level 3 would let him keep safe under Level Limit – Area B and Gravity Bind. That or at least give him a 1700 ATK. Oh well. 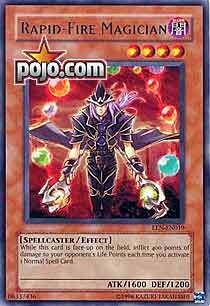 At least Dark/Spellcasters have good support now and will be getting a good boost from the Spellcaster Structure deck due out soon. Effect: A nice, respectable 400 points of burn damage every time you activate a Normal Spell Card. It’s a decent effect, though they could have made it any Spell since they made him a Level 4 with less than 1700 ATK. Or slightly higher burn yield. Again, though, the effect is not bad in and of itself. Combinations: There are some Normal Spells that do solid burn damage: Meteor of Destruction and Tremendous Fire. Then there are just those that are useful or extra fun to abuse with this card, like Toon Table of Contents. Tack on a Dark Room of Nightmare: 700 points of burn damage per normal Spell, 1000 points of burn added onto any normal Spell that does burn damage. Plus, all those things stack. Tack on the normal stall/burn set up, and it’s a fun idea. Is it competitive though? Probably not… yet. But from what I have seen, the Spellcaster Structure deck has some major Spellcaster/burn love in it. Traditional: 1/5-We have OTK burn. No use for stall/burn, really. Advanced: 3.25/5-It can be used in a lot of decks, but not very well. Looks very promising for Spellcaster/burn, which hopefully will be a real deck soon. Limited: 2.5/5-Just barely big enough to fake being a beatstick. There are very few Normal Spells in its set, but half are special use cards. Rapid-Fire Magician is either a slightly underpowered burner or just a slightly ahead of schedule one, waiting for the Spellcaster Structure deck.